Beyonce is coming to Netflix officially. 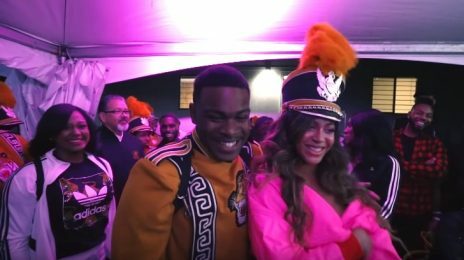 The production is billed as an intimate, in-depth look at the superstar’s celebrated Coachella 2018 performance – which many affectionately re-christened BeyChella. It’ll give unparalleled insights into the emotional road from creative concept to cultural movement. Also spotlighted with be Queen Bey’s journey back to the the spotlight after postponing her initial slot due to being pregnant with twins Rumi and Sir. Yes, yes, and yes! Roll on April 17th! Yes haters can keep seething and staying mad. Bey did not come to PLAY. She came to SLAY.! Oh yes btches!!! I love how we beg for FWT and TMCSWT and she still doesn’t give it to us. Yesss I can’t wait. Although she does these behind the scenes alot like Vegas and revel hopefully this will be alot different. How much is Netflix anyway? They get LIFE by hating on her.. so much worse than even diehard Beehive stans they love to complain about. Why she wait a whole year to put this out? And I’m sorry but thrusting your kitty kat on stage for the umpteenth time doesn’t get more pro black just cause you appropriate Queen Maya Angelou’s voice. Keep it! Yet you will be first to watch it running to this site to ”critique” her pro-blackness or lack off. Be sure to contribute your view to the reign of Queen Bey. Now why would I go watch a year old video of the this fake woke lady shaking her loose walls on stage like she always does?! Im curious to see what she reveals about her process and what she actually has to SAY. Because even is she says ZERO about it she remains iconic, booked, relevant, imitated and BAGGED 💰💰💰💰💰 She has spoken plenty about her creative process (see [email protected] Wynn Las Vegas). What exactly do you want her to say – someone else made all the decisions and she just said yes and went along with it???? SMH You will know what she wants you to know and you will have to deal or look for someone else to give you iconic. Lol 😆 look at the troll seething . Their wigs Better be glued.. Queen is coming . And please don’t bring any of your fav if they never top Forbes list in their life. Queen is > than all your favorites. And blue ivy is coming the next generation is secure . Yesss! I cant wait for re-live Beychella! Like I mentioned before, would have preferred a stand alone performance DVD/stream but this is cool.